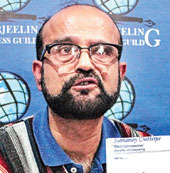 Subhamoy Chatterjee, the most senior Bengali-speaking leader of the Gorkha Janmukti Morcha in Darjeeling who had shown a poster saying "Gorkhaland is the way to all-round progress in the hills, Terai and Dooars" in response to the chief minister's assertion "Darjeeling is part of Bengal" today resigned from the hill party. He also resigned as the councillor of Darjeeling municipality. On January 29, 2013, during Mamata Banerjee's speech at Chowrasta, while many waved posters in favour of Gorkhaland written in English, Chatterjee had shown a placard written in Bengali. The leader who was in prison for more than two months during the last phase of statehood agitation in August 2013, today announced that he "was quitting politics altogether". "I have always contributed to the fulfilment of the identity aspiration of the Gorkhas. I went to jail, I was lathicharged by police in various places but now I have decided to resign from both the party and the municipality. I have not been treated fairly and one does get hurt," he said at a press conference here today. The immediate trigger for Chatterjee's move seems to be the speech of R. Moktan, a Morcha Study Forum member, in Kurseong on Sunday. Moktan allegedly made inflammatory remarks against some hill communities that led to protests. Chatterjee was the vice-president of the Morcha's Darjeeling town committee and later elected as the councillor of ward 25. Chatterjee said that in the municipality he was not even made a member of the chairman in council and no priority was given to his suggestions. "I could not even repair a garbage vat in my ward properly. I was given least priority when it came to allotting development work for my ward, probably because I did not belong to the predominant community," he said. The leader who joined the Morcha when it was formed in 2007 was also a member of the hill party's Minority Forum. "R. Moktan joined the party recently and he has not taken part in any agitation before he made an unwanted statement. All other political parties condemned the statement. But senior leaders of the Morcha, like Bimal Gurung, Roshan Giri and Binay Tamang, did not utter a word," Chatterjee said. Asked about the resignation, Morcha general secretary Giri said: "We have decided to accept his resignation." Chatterjee said he had tendered resignation from Darjeeling municipality "three-four times" in the past. "It was not accepted. But this time, I have decided to quit, whether it is accepted or not," he said. The resignation was handed over to Suk Bahadur Biswakarma, the vice-chairman of the civic body. Municipality chairman Amar Singh Rai said: "I received a message on WhatsApp today about the resignation. He had resigned twice before. This time, he put in his papers without consulting me." Chatterjee's family has been in Darjeeling for five generations and they trace their roots to Devagram in Nadia district. Subhamoy was born in Darjeeling and studied in Maharani Girls' High School, Darjeeling Government High School and later in Darjeeling Government College. He is a commerce graduate from St Joseph's College (North Point). "In 1979, I went to Sikkim and taught in Namchi schools. I returned to Darjeeling in 1987 and taught at West Point. I supported the GNLF then," he said. In 1991, Chatterjee left for Indore to pursue his MBA. He returned to Darjeeling in 1994 to take care of his family's tailoring business. "A tailoring shop had been opened by my father, Late Mani Chatterjee, in 1934. My father's brother, Nanigopal Chatterjee, had worked closely with CPM leaders like Jyoti Basu," he said.